​Vetro Recruitment is committed to providing a high-level service to our clients and agency workers. If you do not receive a satisfactory service from Vetro Recruitment, we need you to tell us about it. This will help us to improve our standards. 1. We will send you a letter acknowledging your complaint and asking you to confirm or explain the details set out. We will also let you know the name of the person who will be dealing with your complaint. You can expect to receive our letter within one week of us receiving your complaint. We will then examine the member of staff’s reply and the information you have provided for us. If necessary we may ask you to speak to them. This will take up to 4 working days from receiving their reply. 4. Alastair Tulloch will then invite you to meet him to discuss and hopefully resolve your complaint. He will do this within one week of the end of the investigation. Within 2 working days of the meeting, Alastair Tulloch will write to you to confirm what took place and any solutions he has agreed with you. If you do not want a meeting or it is not possible, Alastair Tulloch will send you a detailed reply to your complaint. This will include his suggestions for resolving the matter. He will do this within one week of completing his investigation. At this stage, if you are still not satisfied you can write to us again. Another Director of the company, Alun Davies’s will review the decision within 10 working days. We will let you know the outcome of this review within one week of the end of the review. We will write to you confirming our final position on your complaint and explaining our reasons.  Keep up to date with live vacancies and industry specific news. Register your organisation with Vetro Recruitment today and allow us to find professional candidates to fill vacancies anywhere in the United Kingdom.